The District Department of Transportation has chosen a preferred layout to double the number of tracks over the Potomac River to Arlington, Virginia, and also add a new way to walk or bike across the river. WASHINGTON — In a crucial step toward expanding train service for D.C.-area commuters and longer-distance travelers avoiding Interstate 95 traffic, the District Department of Transportation has chosen a preferred layout to double the number of tracks over the Potomac River to Arlington, Virginia, and also add a new way to walk or bike across the river. The preferred alternative revealed Thursday would retain and repair the existing two-track Long Bridge built in 1904, while adding a new two-track bridge just to the north between the existing bridge and Metro’s Yellow Line bridge. The new bridge is projected to take five years to build once construction starts. Final federal approvals for the project are currently expected in early 2020, which would allow for contracting to begin then if funding is available. The study is funded in part by a federal grant, but it is not yet clear how bridge construction would be paid for or whether the bridge would be publicly or privately owned. More precise cost estimates for construction are still being developed. CSX owns and controls the current bridge. Virginia, D.C. and the rail operators that use the bridge would likely foot parts of the construction bill. They hope federal funding is available to cover at least part of construction, too. Once the new bridge opens, it will open up a bottleneck for both freight and passenger rail traffic that has limited service between Richmond and D.C.’s Union Station, potentially supporting more than double the number of trains each weekday by 2040. Today, there are 34 one-way trips over the bridge each weekday by VRE trains, 24 by Amtrak trains and 18 by CSX freight trains. The additional tracks, which could at least partially be dedicated to passenger rail traffic, would contribute to a long-planned expansion of Amtrak service in Virginia, allow for increased VRE commuter rail service, and potentially smooth discussions about extending some MARC train service that currently ends at Union Station through to Arlington or Alexandria. The study projects there could be 92 VRE trips, 8 MARC tips, 44 Amtrak trips and 48 freight trips each day by 2040, which would take significant pressure off traffic-clogged roads such as I-95 and U.S. 1. The final Draft Environmental Impact Statement also responds to an outpouring of support for a new way to walk or bike across the river by keeping the option to build a separate bicycle and pedestrian bridge about 25-feet upriver from the new tracks. It would connect Ohio Drive SW near the Jefferson Memorial to the area of Long Bridge Drive near Long Bridge Park in Arlington, not far from Pentagon City and Crystal City, with a connection also possible on the Virginia side to the Mount Vernon Trail. 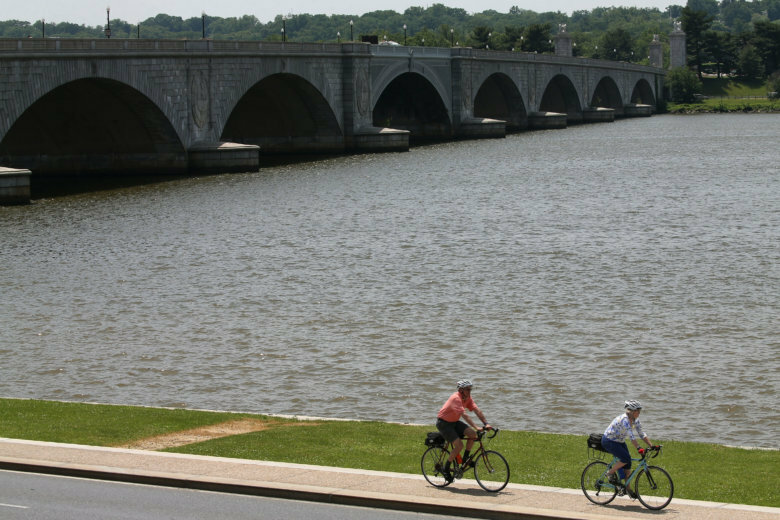 Today, the only way to walk, jog or bike across the river in that area is the sidewalk next to traffic on the 14th Street Bridge, or going about 1 mile north to the Memorial Bridge. The bicycle and pedestrian bridge is being considered to mitigate any lost Arlington park and National Park Service land that would be taken for the new rail bridge. 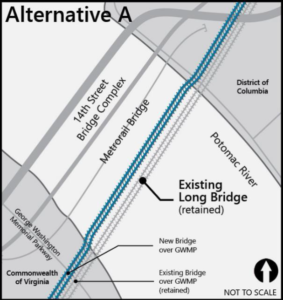 The rail bridge over the Potomac would require a new bridge over the George Washington Parkway next to the existing bridge that crosses near the exit from the northbound parkway to I-395 North to cross the river. The additional tracks could also require a bit of land currently part of Arlington’s Long Bridge Park. On the D.C. side, the rail expansion would also require a new two-track rail bridge over I-395, Ohio Drive SW/Washington Channel, and Maine Avenue SW. The preferred designs were revealed at an informational meeting Thursday evening, eliminating other options that remained under consideration to completely replace the existing Long Bridge for rail traffic and to build a bike and pedestrian connection more closely-connected to the new upstream rail bridge. Completely rebuilding the existing bridge would have made construction last up to three years longer, required more construction over the GW Parkway, and cost $500 million more upfront, the analysis concluded. 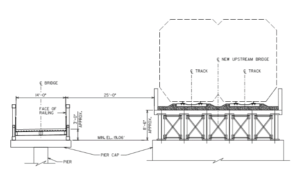 The separate bike and pedestrian bridge was chosen over one more closely connected to the new rail bridge because it has a smaller footprint, is easier to inspect and helps keep National Park Service and railroad properties separate. It is also about 20-percent cheaper. Comments can be emailed to info@longbridgeproject.com. The current two-track Long Bridge was built in 1904. Most of the structure was renovated in the 1940s to support heavier trains. A middle piece of the structure that once spun to open to allow boats through has not been opened since March 1969.